I like weddings, but am admittedly not “into” celebrity weddings. So it was not surprising that I wasn’t glued to the screen during the royal wedding of Prince Harry and Meghan Markle. In fact I only took interest when I began hearing about “the sermon that brought down the house” from American Bishop Michael Curry. 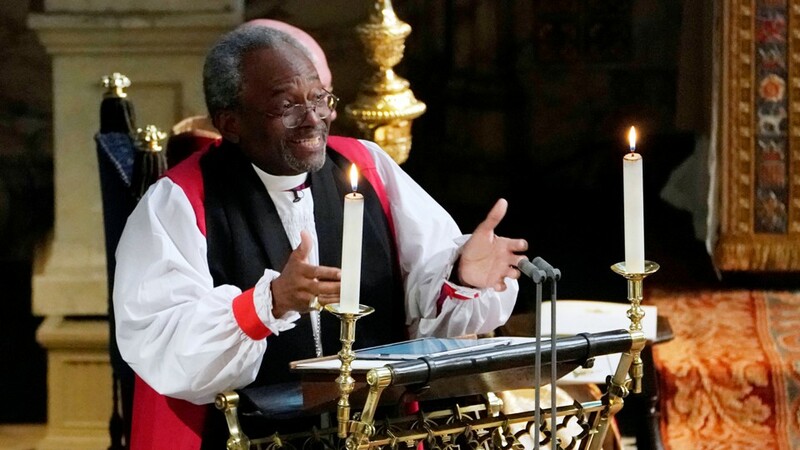 Bishop Curry is known as a sometimes controversial figure in the church due to some of his positions on gay marriage and a mix of other leanings. I am not going to comment on those, but I will comment on a more central issue that seems to have surfaced with his message. If you haven’t heard the message yet, you can listen to it HERE before reading on. John Lennon communicated the same message in his 1967 song “All you need is love. Love is all you need.” However, if all we needed was love, then Jesus would not have needed to die on the cross. The Good News of Jesus Christ is not good because it is “nice.” It is good because it sets prisoners free from sin. So it requires us to recognize our sin, repent from it and place our faith in God. God’s forgiveness is only made possible through the death and resurrection of Jesus Christ who has made us acceptable; and we must each humble ourselves and ask for His forgiveness. Then, and only then, are we able to know the depths of God’s love. Somehow, over a very short span of time, many of our ministers have begun to overlook words like “repentance” and “forgiveness” by amplifying concepts that seem to diminish personal responsibility. They want to be positive and avoid offending anyone. But by its very nature of being holy and different, the message of Jesus confronts us and offends pride. The first words out of Jesus’ mouth recorded in Mark’s Gospel are “The time is fulfilled, and the kingdom of God is at hand. Repent, and believe in the gospel.” (Mark 1:14) “Repent” is not a dirty word. It is a required response; turning from the old so that you may believe what is good from God. Then… once people repented, He was able to teach them how to love. If we want to look further, consider the early church. They followed the same pattern, understanding that the new life in Christ required leaving the old life of sin. God “now commands all men everywhere to repent.” (Acts 17:30) It’s commanded. Not suggested. Trying to love better, apart from knowing God is merely self-effort. That is called humanism. It is not the good news of Jesus Christ without the cross. “But Jason! It’s just a wedding sermon” some friends have told me. Yea, …I get that. and I agree that “love” is a very appropriate topic; especially for a wedding! But if Curry, who calls himself the “Chief Evangelism Officer” of the Episcopal Church claims that this is “the gospel”… and other ministers agree, then we are in for a terrible shaking in the church. Before praying for revival, it is time to revisit the message we claim to uphold. Take a few minutes and ask yourself, “What is ‘the Gospel’?” Make certain you know. Curry had a platform to share the ‘gospel’ to the world. Your moment may be ahead. Take every chance to call every man, woman and child to repentance and enter into the love of God and let His love (not our humanistic efforts) transform the world. Previous Post REPORT: Manokwari, Indonesia Next Post What to Make of the Death of John Chau?